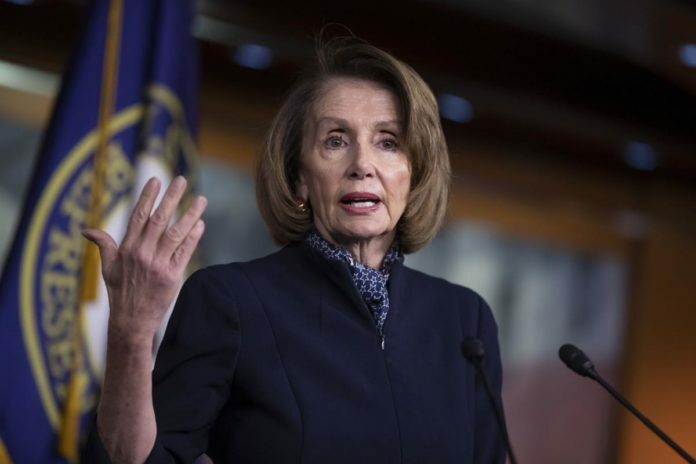 Shutdown pressure on President Donald Trump mounted Wednesday as House Speaker Nancy Pelosi called on him to delay his State of the Union address and his own economists acknowledged the prolonged standoff was having a greater economic drag than previously thought. The White House planned further meetings with rank-and-file lawmakers Wednesday, though few saw those sessions as likely to budge either side. Administration officials sought to project confidence even as Trump’s economists indicated the shutdown was having a greater impact than previously predicted. An economic shift could rattle Trump, who has tied his political fortunes to the stock market and repeatedly stressed economic gains as evidence that his tax-cut package and deregulation efforts are succeeding. Economic optimism had already cooled somewhat as Trump’s trade fight with China shook the markets. Roughly 1 million government employees and contractors aren’t being paid. Travel plans are compromised by shuttered federal parks and airport delays. Some Americans trying to start small businesses face delays in obtaining the required tax identification number from the IRS. “I know there has been some impact, but at the same time we’re focused on the long term economic principles the president has laid out,” she said. “We’re going to stay out for a long time, if we have to,” Trump said. He also suggested the partial shutdown, which has clogged airport security lines and shuttered federal agencies, was going smoothly. Behind the scenes, though, the administration and its allies on Capitol Hill are warily eyeing the next payday. They hope to reach a resolution before a Tuesday deadline, when they’ll need to prepare the next round of paychecks for workers who have been seeing zeros on their pay slips. The letter, a copy of which was obtained by The Associated Press, states that the senators will make “our best efforts” to address the Trump administration’s request for money to address security and humanitarian issues at the border. It is not clear how many senators have signed on. Pelosi is such an idiot. She really thinks the president will submit his State of the Union address in writing? What an idiot! Her botox is probably getting too tight around her brain. Trying to snake and undermine his power. disgusting. Just cancel it. Submit by written report as the Constitution requires. What, she’s so worried about his security? Maybe she’s worried about HER security! She suggests that they work together? He should say he’ll only work together to come to a conclusion about the wall. He shouldn’t give her an inch! Trump will deliver it anyways, but instead of a joint session of Congress (half of whose members hate him and will show their disapproval to a national audience), he’ll be speaking to friendly audience (perhaps the Republican caucus). The legal requirement can be met by email the text or sending a video – but the “minhag” is for an in-person address, and the Democrats are the one’s going against the well established minhag. Trump can give his address without hecklers, and with loud cheering from the audience, and Pelosi comes across as the one who doesn’t respect the constitutional tradition. Score one for the Donald. Pelosi is actually giving him good advice, even this liar couldn’t convince anyone with half a brain that things are great in the middle of all this chaos. He’ll speak, and on time.. You & the moping, angry losers are free to walk out, glumly not applaud, or sleep, as you did previously. You’ll choke first, before he cancels. rt you are such a liberal pls do not post anything on here. she and her ‘friends’ are disgusting bigots. cant wait to see their downfall!!! ☕️coffee addict on How do I stop Yeshiva World News from reporting the news?